Student debt in the U.S. now stands at about $1.5 trillion. It's a number we often call a crisis, advising students to avoid borrowing if they possibly can. One of the ways schools have tried to help students cut down on their debt is to stop packaging federal loans with scholarships and grants in financial aid award letters. It could be the case that, even if a student were eligible for a loan, the award letter would show zero loan dollars. About half of community colleges are now doing this. "It's part of the narrative of the student debt crisis," says Lesley Turner, an assistant professor of economics at the University of Maryland. "Avoid borrowing unless it's absolutely necessary." And what happened to those students who borrowed? "They attempted more courses, they earned more credit, and they had higher grade point averages," says Turner. The research also found a sizable increase in the likelihood of those students transferring to a four-year public school for a bachelor's degree. "The most likely explanation," explains Turner "is that this loan allowed students to work less." "The cost of college creates a stress," says Oded Gurantz, an assistant professor at the University of Missouri who studies higher education. "So if the money frees [students] up so they're not focusing on where they're going to get their next meal, I actually think it makes a lot of sense that it could help their academic achievement." 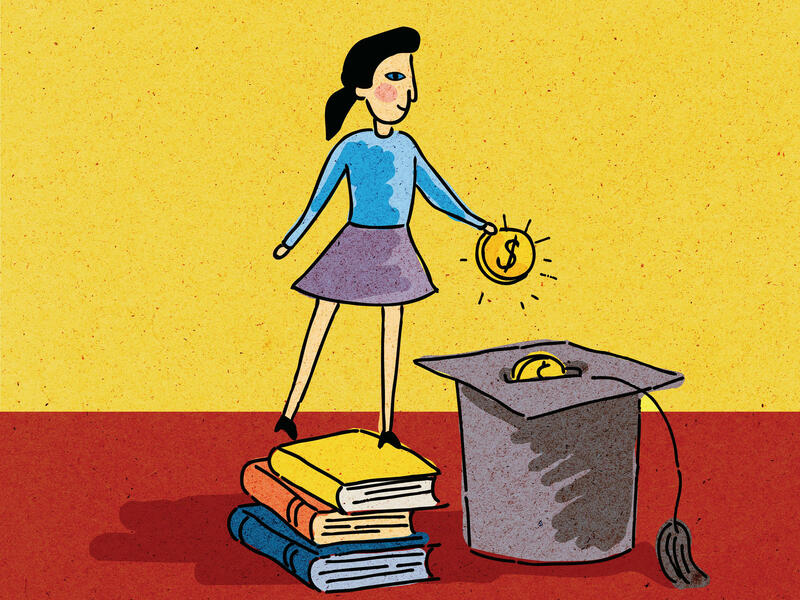 "There's plenty of risk embedded in taking on a student loan," says Mark Huelsman, an associate director at the think-tank Demos. "Student debt can impact the ability to buy a house, impact the ability to save for retirement, or save for a rainy day or a crisis." Sure there are reasons not to borrow, but Huelsman says, on an individual level — if the difference between a small loan is finishing college or not finishing — that's a different story. "We can critique the current system, but we don't want to pull the rug out from someone who just needs that last $2,000 to pay for food." It's also true that not all student debt is created equal, explains Sandy Baum, a fellow at the Urban Institute. For many people, student loans helped them get a degree and a higher-paying job. "Borrowing money for college is a very reasonable thing to do," she says. "It is going to increase earnings for most people by far more than the amount that they will have to repay." "It's not that loans are bad," says Gurantz, from the University of Missouri. There are certain groups of students we should be more concerned about, like students who take out small amounts of loans, don't earn their degree and have a very difficult time paying back those loans, he says. Student loans also impact students of different races and genders in different ways. "There's no one size fits all: All students should borrow or all students should not borrow," says Turner, "but loans aren't always a bad thing." It's too soon to know if the students in this research — the ones who took out loans and did better — will fall into the loan trap, or be the students who end up getting a degree. Student debt in the U.S. now stands at about $1.5 trillion dollars. We talk of that as a crisis. And it certainly is for graduates who struggle to pay it back. People warn students to avoid borrowing if they possibly can. But this story examines the flip side. Isn't borrowing sometimes good? Just ask any family that borrowed to get into a house. Some researchers discovered a kind of real-world experiment. It was a chance to find if borrowing leads to a better education for community college students. Elissa Nadworny explains. ELISSA NADWORNY, BYLINE: One of the ways schools have tried to help students cut down on their debt is to not package federal loans in the financial aid award letters that they send to students. This happens regardless of whether a student is eligible for federal loans. And about half of community colleges do it. LESLEY TURNER: It's part of the narrative of the student debt crisis - you know, avoid borrowing unless it's absolutely necessary. NADWORNY: That's Lesley Turner, an assistant professor of economics at the University of Maryland, talking over Skype. She and her colleague Benjamin Marx at the University of Illinois are studying this. And when students were offered loans in their letters and they took them, they weren't a bad thing. Instead, the small loan really helped students. TURNER: They attempted more courses. They earned more credit. And they had higher grade point averages. TURNER: There were also sizable increases in the likelihood of transferring to a four-year public institution, to a bachelor's degree program. NADWORNY: So why is this all happening? TURNER: The most likely explanation, we think, is that this loan allowed students to work less, that they would have had to work to pay for their living expenses, to pay for their transportation. NADWORNY: The loan may have freed up time in their schedules to take more classes, to study, to finish their schoolwork. And remember, these are community college students. So even though tuition is low or even free, there are other expenses. ODED GURANTZ: The cost of college creates a stress. NADWORNY: That's Oded Gurantz, an assistant professor at the University of Missouri. He studies higher education. GURANTZ: And so if the money frees them up so they're not focusing on, you know, where they're going to get their next meal, I actually think it makes a lot of sense that it could help their academic achievement. NADWORNY: But, Gurantz says, the difference between short-term outcomes, like the researchers found, and long-term outcomes is really important. GURANTZ: It's not that loans are bad. NADWORNY: But, he says, there are certain groups of students we should be more concerned about. GURANTZ: There are students who take out small amounts of loans, don't earn their degree and have a very difficult time paying back those loans. NADWORNY: It's too soon to know if the students in this research, the ones who took out loans and did better, will fall into this loan trap or be the students who end up getting a degree. Elissa Nadworny, NPR News. (SOUNDBITE OF IKEBE SHAKEDOWN'S "SHE'S KNOCKING") Transcript provided by NPR, Copyright NPR.